To help illiterate voters, the "No" team used oranges and bananas meant "Yes"
Voters in Kenya have emphatically rejected a proposed new constitution, incomplete results show. With fewer than 500,000 ballots to count, the "No" campaign has an unassailable lead of almost 1m votes. The BBC's Adam Mynott says the result is a huge setback for President Mwai Kibaki who led the "Yes" campaign. His spokesman has conceded defeat. 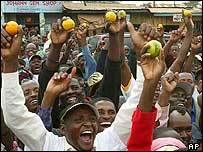 Crowds of people have been celebrating the result on the streets of the capital, Nairobi. "No, no, no," they shouted, some wearing orange - the colour of the "No" campaign. The president is due to address the nation shortly. Government spokesman Alfred Mutua told the AP news agency that the "No" campaign has an unassailable lead. 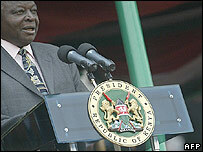 Many Kenyans treated the referendum as a protest vote against Mr Kibaki ahead of general elections due in 2007. The latest figures released by the Electoral Commission of Kenya (ECK) show 58% (3,480,642) voted "No" while 42% (2,492,229) backed the draft. Our correspondent reports from Nairobi that the margin in favour of those rejecting the proposed constitution may widen, as many of votes from the "Yes" campaign's heartland have already come in. Mr Kibaki's cabinet was split, with seven ministers, including charismatic Roads Minister Raila Odinga, joining with the opposition, urging voters to reject the constitution. If the president had won the referendum, it is likely he would have sacked the rebel ministers but his authority is now diminished and theirs is enhanced. Our correspondent says the returns have shown Kenyans voting according to tribal affiliations - evidence of how the referendum campaign has split the nation along ethnic lines. Turnout in Kenya's 210 constituencies is believed to have been more than 54%. The election commission said the voting had been mostly peaceful and had gone pretty smoothly. Minor clashes occurred in the town of Kisumu and Nairobi's Kibera slum. During the campaigning, nine people were killed in violent clashes. The "Yes" team used the banana symbol, while an orange represented the "No" campaign. The fruits were chosen by Kenya's electoral commission as non-party political symbols and to aid illiterate voters. Security across Kenya was increased for the voting, with some 50,000 police drafted onto the streets. The new constitution would have introduced the role of a prime minister and provide greater rights for women, devolution and land reform. Kenya's basic law has not been re-written since independence from the UK in 1963. The president has promised a new constitution since 2002 but the drafting process has seen many delays. His opponents say his final draft reneged on previous promises to share out power and so reduce corruption. About 19,000 local observers and some 150 diplomats monitored the vote. Kenyans vote on a new constitution which has sparked violent protests and split the cabinet. Should Kenya hold new elections?